The Annapolis Tidal Power Plant came online in 1984. The turbine is a single effect 7.6 m diameter horizontal axis Straflow turbine designed to generate power during discharge from the reservoir into the sea. It has a capacity of 20 megawatts and a daily output of roughly 80-100 megawatt hours, depending on the tides. Located in the Bay of Fundy and Annapolis River, near Granville’s Ferry and Annapolis Royal, Canada. In 1980 Nova Scotia Power started construction on Hogg Island at the mouth of the Annapolis River as a federal and provincial government pilot project. Four years later the construction was complete and the station began operation. It is currently the third largest tidal barrage in the world. The Annapolis Tidal Generating Station generates electricity from tidal flows in the Bay of Fundy, and operates in full compliance with all regulatory requirements (i.e. Fisheries Act). Although Annapolis Tidal maintains operating agreements with DFO, no formal Operating Approval exists for Annapolis Tidal with Nova Scotia Environment (NSE), as the facility operates in federal jurisdiction solely. 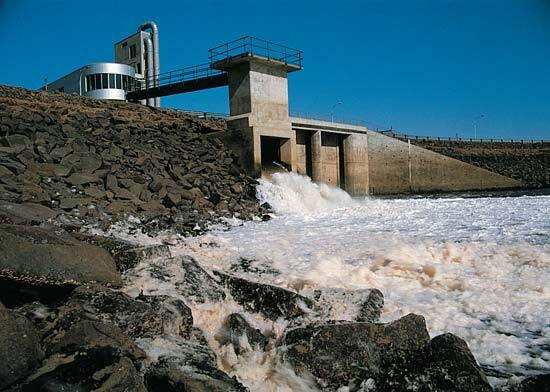 EIA included release of suspended sediment, scour in existing channels and at adjacent shorelines, flood flow management, and passage of anadromous fish through the barrage. Concerns with increased basin water levels included interference with existing agriculture, flooding, and accelerated rates of bank erosion. August 2004: a mature Humpback whale (nicknamed Sluice) swam through the open sluice gate at slack tide, ending up trapped for several days in the upper part of the river before eventually finding its way out to the Annapolis Basin. Spring 2007: When a body of an immature Humpback whale was discovered near the head of tide in the river at Bridgetown. A post-mortem was inconclusive but suggested the whale had become trapped in the river after following fish through the sluice gates. Annapolis Tidal Station is located in Canada. Environmental Impact Assessment results. Monitoring plans post deployment. Release of suspended sediment, scour in existing channels and at adjacent shorelines, flood flow management. Passage of anadromous fish through the barrage. Increased basin water levels included interference with existing agriculture, flooding, and accelerated rates of bank erosion.